Owens Valley was a blaze of color last fall. 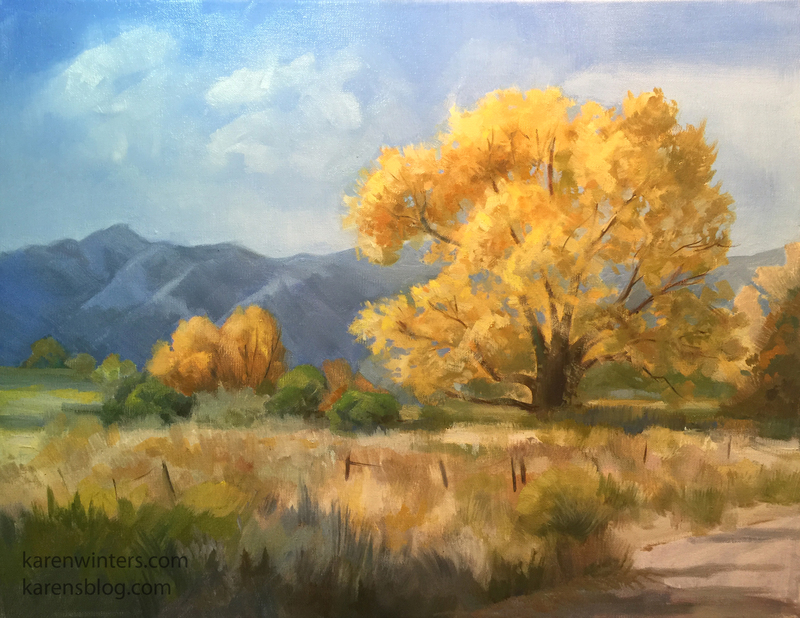 The cottonwoods fairly glittered in the sun. This is one of my favorite locations to paint, near Swall Meadow, Round Valley. The blues and golds complement each other so well. 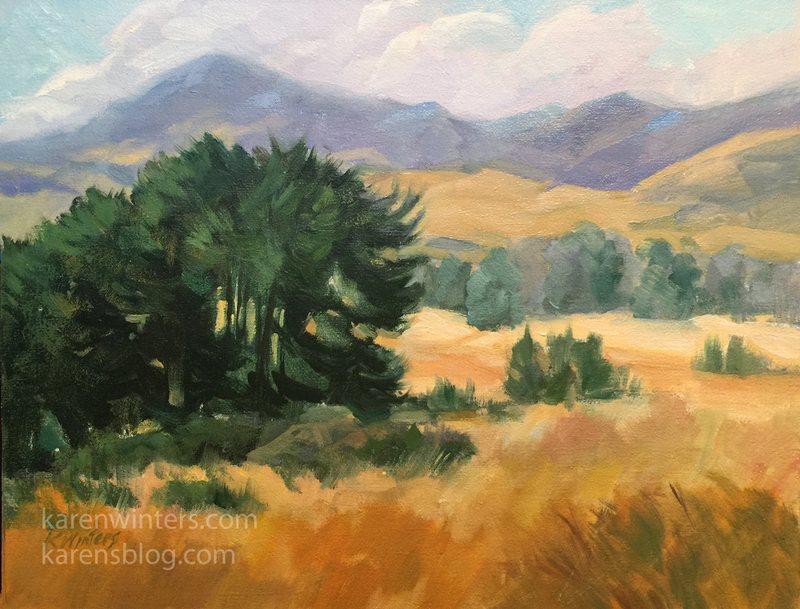 I don’t usually paint in series, but lately I’ve been focusing on different explorations of California’s golden rolling oak covered hills. This is the first wide-format one that I’ve done. The other most recent ones were both 20 x 24 inches. This painting represents the California Central Coast region, near Cambria, Morro Bay, Cayucos and Paso Robles. I wonder how much the oaks have recovered this year following the several years of drought. 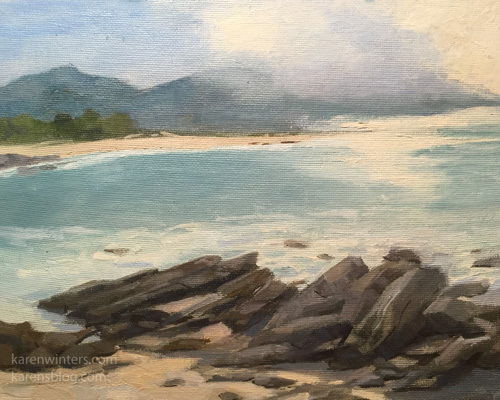 This painting is now sold, but you can write for information about others. This painting is quite special to me as it was the 1000th one I completed. I thought I had posted it on my blog last year, but discovered that I missed it. If you’ve been to Yosemite Valley, you’ll recognize the view from Sentinel Bridge, with Half Dome reflected in the calm waters. 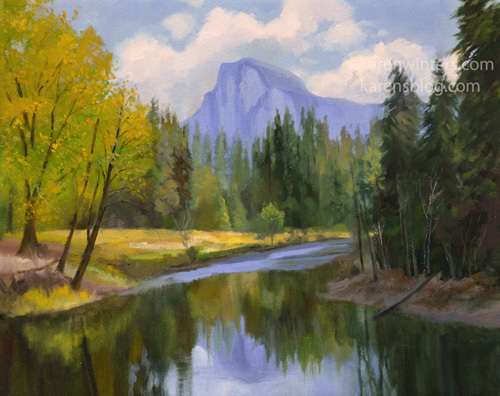 With our current snowmelt, I’m guessing that the Merced River is anything but calm right now. It’s poppy time in the high desert – the Antelope Valley – and this year’s rains mean everything is positively brilliant. 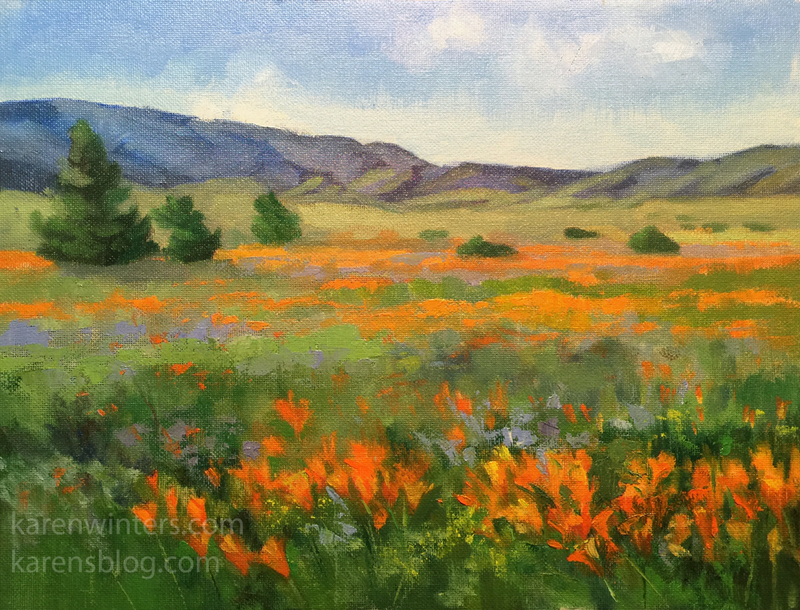 This new painting of California poppies blooming as far as the eye can see also includes touches of lupine, fiddlenecks, and other spring flowers. My California poppy paintings sell quickly every year, so don’t hesitate if this one calls to you. 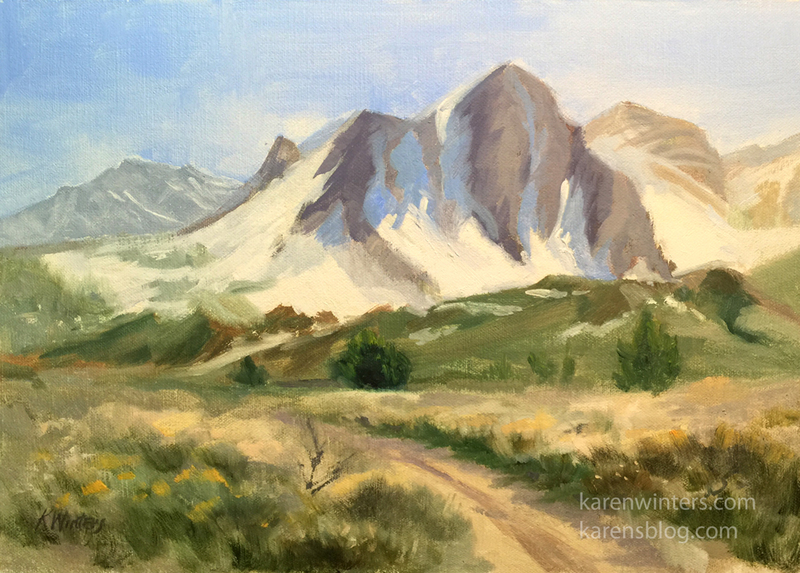 This plein air painting was painted last spring up in “Buttermilk Country” west of Bishop, in the foothills of the Eastern Sierra. We had as our guide a friend of ours who grew up in the area and knew every back road and one lane gullied path through the sagebrush. Eventually we ended up at this beautiful wilderness location. SOLD, now in a private collection. 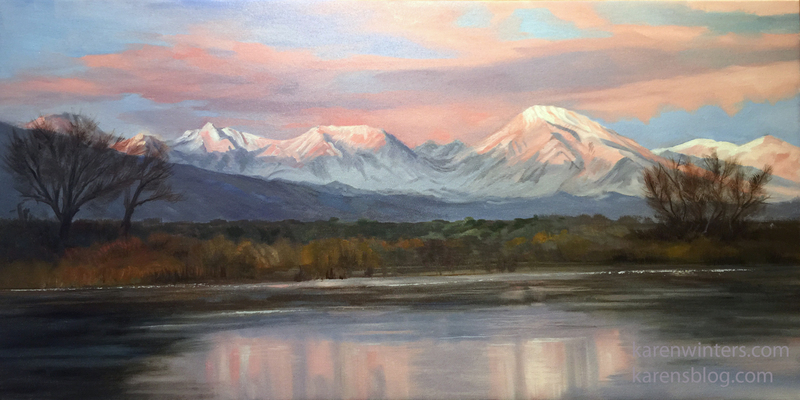 The inspiration for this new painting came one frosty morning on December 27, 2016, on our way home from a Christmas vacation with our family. My husband and I promised each other that as long as the sky was clear, we’d get up before dawn to see the alpenglow on the Sierra range. We were not disappointed. It was about 19F outside, but we were bundled up, and it was worth the effort. Ducks and coots were skimming over the water where it was not icy. We learned today that some eastern Sierra areas, namely Mammoth Lakes, received 18-19 feet of snow, to the joy of skiers. I’m glad that the mountains were not totally snow-covered when we were there. I like the way the sun turned the granite pink in contrast to the white of the snow. 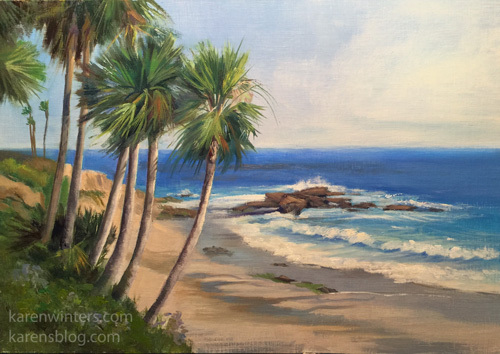 This California landscape impressionist painting is from recent travels in the Central Coast, along Highway One, just a little north of Morro Bay. Cypress trees are abundant in that area, and mix it up with the local oaks. Although the hills are brown and golden, typical for the summer, there is more grass evident than in the past few drought years. 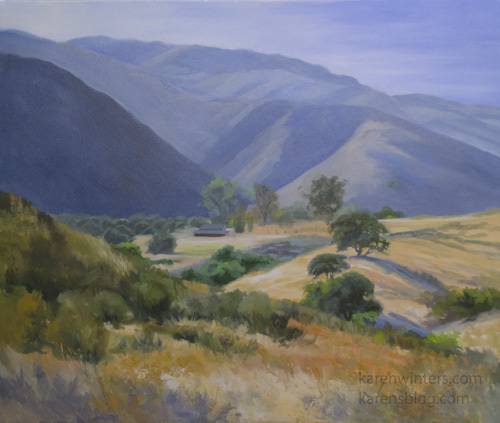 This stretch of road is one of the prettiest in Central California for classic views incorporating mountains, golden fields and majestic oak trees. I painted the similar area before in “Fields of Gold,” and will no doubt return to that section of the state again and again.